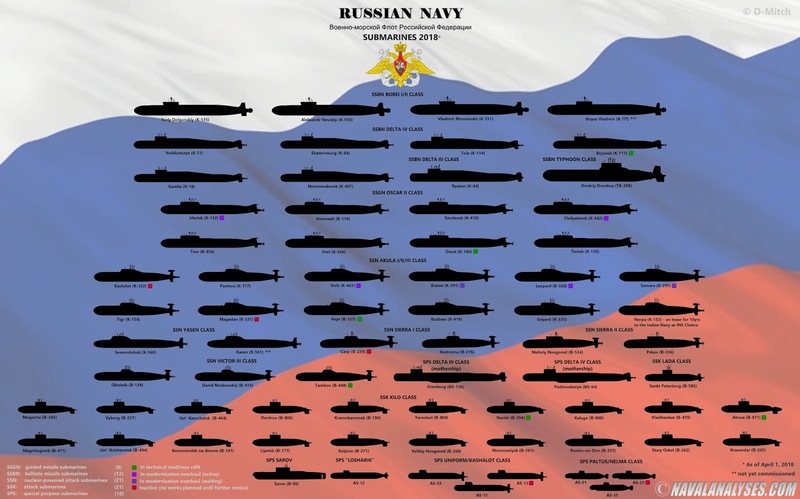 In the following infographic, The Russian Navy submarines in 2018, I depict all the submarines that are currently in commission with the Russian Navy (as of April 1, 2018). Currently, the Russian Navy (Russian: Военно-морской Флот Российской Федерации (ВМФ России), lit. Military-Maritime Fleet of the Russian Federation) operates an impressive number of powerful nuclear-powered and diesel electric submarines,. The Russian ballistic missile submarine (SSBN) fleet consists of four (4) Borei class SSBN (the fourth vessel and lead ship of the fifth generation Borei II-class, Knyaz Vladimir, is scheduled to enter service this year), six (6) Delta IV class SSBN, one recently overhauled Delta III class SSBN (Ryazan) and the last (and upgraded) boat of the largest ever built submarine class, the Typhoon class Dmitriy Donskoy (TK-208). Moreover, Russia operates eight (8) Oscar II class guided missile submarines (SSGN), 11 Akula I/II/III class nuclear-powered attack submarines (SSN) plus one more boat (Nerpa) which has leased to India from 2012 for 10 years (Chakra), one Yasen class SSN while one more, K-561 Kazan, is about to be commissioned this year, three (3) Victor III class boats and four (4) Sierra I/II class boats. The active diesel electric submarine fleet consists of 21 boats, all of them except one boat (Lada class B-585 Sankt Peterburg) belong to the Kilo/Improved Kilo class attack submarines. 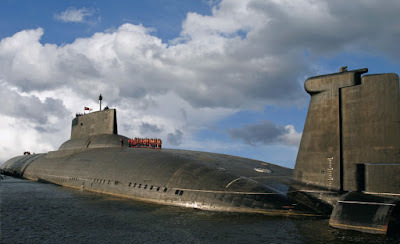 The Russian Navy maintains also a significant amount of special purpose submarines including two nuclear-powered modified Delta III/IV boats (they operate as motherships for mini submarines, for a combination of oceanographic research, search and rescue, and underwater intelligence-gathering) as well as the 90 (?) -meter Sarov and the nuclear-powered AS-12, known also as Losharik. It should be mentioned that many boats are still inactive or in modernization overhaul, so for some of them their status is unclear. The Russian Navy submarines in 2018. For a high resolution image click here. I would like to thank a lot my friend Artjom H for his great help, and specifically for the provision of accurate information about the number of boats and their current status in service with the Russian Navy as well as for his (really impressive) patience answering all my questions! That's a joke! The Russian sub fleet is a rusted joke.Many of there subs aren't fit to leave port. You never know when their subs leave ports. You never know when their subs leave their ports.
))) They main ones never leave ports. They are always nearby along both coasts. The time in the oceans is only limited to food supplies. Just one of our sub's is just enough to turn a continent into a radioctive ash in case of the retaliotory strike of course. I see that the people in the comments like learning. Learn this: the tested and proven speed of our main subs' missiles is 4 miles per second. So get real, people! Start the real learning and understanding. From Russia - with love and peace! Russia has built and continues to build a load of new submarines. Perhaps you haven't looked into the subject since 1998. The situation has changed drastically since then. The comment "The Russian sub fleet is a rusted joke.Many of there subs aren't fit to leave port." is nothing more than xenophobic wishful thinking based on 15 to 20 year old information. Russia is standing again, get used to it, Borey and Yasen subs have no match, and now Poseidon super torpedoes are coming. Thank you for bringing together this information, I came to your site because I found your infographic somewhere else, properly credited. IMHO would be even better if the Pacific fleet (which keeps in check China fleet and US Pacific fleet were shown separately from the rest, which has to protect Russia (and Syria now) from NATO aggressions (except for the Caspian flotilla which mainly prevents Iran from having bad ideas, but it has no sub). Thank you for your good words dear Paul! Jessie, please learn to spell, then try your comments again. Please remember, these sites are more dedicated to people that enjoy learning and understanding. This is not your AOL chatroom. Thanks! Jessie the Russians are broke, no money and can barely maintain and deploy their fleet. You must be feeling humorous. No money, staving. Broken economy! but first military machinery, war crafts and defence technology. Первым делом первым делом самолеты.. А девушки и все остальные потом! My friend, our children are born without debts as Russia has no state debts. If you take the US debt and divide it amongst the US population, you will see that every newborn US child owns the world USD 150k just for being born there. So you better recognise who is the beggar in the house. If you look at and read the Legend on the high resolution copy of the Russian chart there are at least 5 inactive Akula class boats and their Diesel boats are ancient. In some instances they are towing rusting hulks into the yards for modernization. No cash to modernize when their oil market dried up. It is very nice to know that most of the comments can be associated with great concern about Russian submarines. Stay cool. The Russian Navy can reflect any challenge from any modern Navy in our time. One of our subs is just enough to turn a continent into a radioactive ash. In case of a retaliatory strike of course. The tested and proven speed of our sub's missiles is 4 miles per second. So - get real! Nice summary.. I'll save the link, Thanks. What's best about Russia: If you don't like it, just pull away. With all of America's submarine and nuclear fire power, our citizens still have no universal, non-profit, single payer, health care system such as much of the free world has enjoyed for years. It seems the ability to kill is more important that the health and well being of all our citizens. Shame!